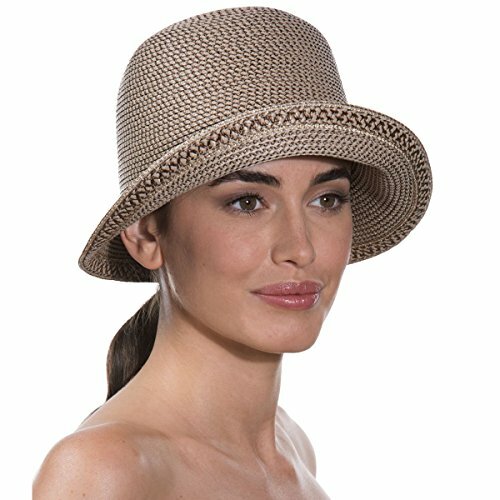 Eric Javits Luxury Fashion Designer Women's Headwear Hat - Squishee Bucket - Bark by Eric Javits at Laurenee Lifestyle. MPN: 4331302006. Hurry! Limited time offer. Offer valid only while supplies last. Casual sunhat of Squishee® has a sloped brim that provides great coverage for those who don't want ''too much hat!'' Rolls and folds into a tote bag. Casual sunhat of Squishee® has a sloped brim that provides great coverage for those who don't want "too much hat!" Rolls and folds into a tote bag. Elasticized inner band fits most. Signature rivet logo is discretely placed at the back of the crown. Blocks 95% UVA/UVB rays. Independent testing in accordance with AATCC (American Association of Textile Chemists and Colorists) test methods have determined this product's effectiveness for blocking ultraviolet radiation as well as UVA/UVB radiation. This product was awarded the highest rating of 50+ UPF by independent testing.